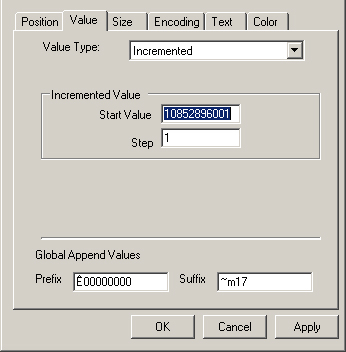 If IDAutomation’s Barcode Label Software is being used to create a sequential SSCC18 barcode that increments for each label, plus the need to calculate the MOD 10 check digit required by the UCC, this solution will help. To obtain more information about SSCC18, UCC128 and EAN128 barcodes, please visit the UCC/EAN section of IDAutomation’s Code 128 FAQ. NOTE: The information provided here is superseded by the SSCC-18 Barcode Label Tutorial. 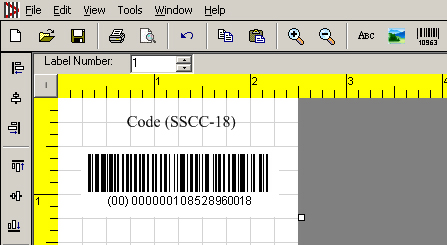 However, the tutorial provided here is still applicable and provides an alternative method of printing the SSCC18 barcode. 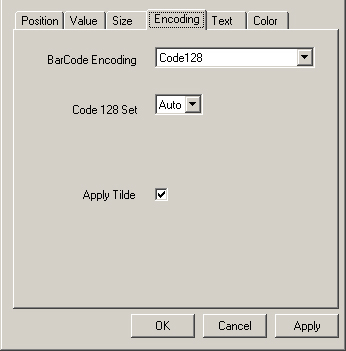 When using Code 128 to create SSCC18 barcodes, every barcode must begin with a Start C character followed by a (FNC1) “function code one” and an Application Identifier (AI) number directly after each FNC1. The Application Identifier (AI), or ASCII 202 character, defines the barcode data fields in the Code 128 barcode. Each AI uniquely identifies the meaning and format of the data following it. The AI has parentheses around it in the human-readable interpretation of the information. However, the parentheses are not encoded in the barcode, just the numbers. The SSCC18 symbology requires a MOD 10 check digit on the 17 digit number that is used after the FNC1 character and AI. To demonstrate, an example of how this works is shown below by encoding the number 00000010852896001 in the SSCC18 barcode. The MOD10 check digit of 00000010852896001 is 8 and this is added to the end of the number. Then add the AI of 00 to the beginning of the number. The resulting number encoded in the barcode then is 00000000108528960018. Right click on the barcode located on the label and go to “properties.” On the encoding tab, make sure the “apply tilde” option is checked, and Code 128 as the “Barcode Encoding” selected, as well as the Code 128 set to AUTO. As the start value will not retain any leading zeros, these need to be placed in the prefix along with the FNC1 character and the “00” AI required for the SSCC18 barcode. In this example, because the start number is 00000010852896001, place “Ê00000000″ in the prefix field and the”10852896001” in the start value field. To generate the MOD 10 check digit, use the format ~mnn in the suffix field. “nn” is a 2 digit number representing the number of characters preceding the tilde in which to base the MOD 10 calculations. With the SSCC18, pass through 17 characters and the 18th character will be the MOD 10 check digit. Example: entering the data of Ê0000000010852896001~m17 creates a barcode with the FNC1 character followed by an AI of (00) and the number 000000108528960018.